Everyone feels anxious from time to time. Stressful situations such as meeting tight deadlines or important social obligations often make us nervous or fearful. Experiencing mild anxiety may help a person become more alert and focused on facing challenging or threatening circumstances. But, individuals who experience extreme fear and worry that does not subside may be suffering from an anxiety disorder. The frequency and intensity of anxiety can be overwhelming and interfere with daily functioning. Fortunately, the majority of people with an anxiety disorder improve considerably by getting effective psychological treatment. What are the major kinds of anxiety disorders? There are several major types of anxiety disorders, each with its own characteristics. People with generalized anxiety disorder have recurring fears or worries, such as about health or finances, and they often have a persistent sense that something bad is just about to happen. The reason for the intense feelings of anxiety may be difficult to identify. But, the fears and worries are very real and often keep individuals from concentrating on daily tasks. ATTENTION DEFICIT DISORDER/ATTENTION DEFICIT HYPERACTIVITY DISORDER (ADD/ADHD) - This disorder, like most others, needs careful examination and assessment by a clinical psychologist. Other difficulties in childhood may have symptoms similar to ADD/ADHD but may not be, thus careful evaluation is necessary. Symptoms of ADD are inattentiveness, while ADHD symptoms include inattentiveness, hyperactivity, and impulsivity. BORDERLINE PERSONALITY DISORDER - A pervasive pattern of instability in interpersonal relationships, self-image, and moods. Individuals with this disorder may experience impulsivity, feelings of emptiness, inappropriate and intense anger, and self damaging behavior. DEPRESSION - A depressive disorder is a disorder that affects one's body, mood, and thoughts. It can also prevent one from falling asleep or staying asleep. Additionally, one's appetite may increase or decrease, one may feel pervasively down, and that his/her down mood is not changing. Depression is not a sign of weakness. In general down moods, one may be able to lift him/herself up once the stressor lifts however , in a depressive disorder, the ability to lift oneself up is more difficult. If left untreated, symptoms could last for weeks, months, or years. Treatment is available and is effective to help alleviate suffering. EATING DISORDERS - Eating disorders occur when one has a distorted body image. Specifically, one may perceive they are overweight when the person is actually a normal weight or is underweight. A person experiencing this may fear gaining weight. Anorexia Nervosa, is an eating disorder in which a person severely limits food intake (restricting type) or experiences binging followed by purging (Binge-Eating/Purging Type). Bulimia Nervosa, another eating disorder, involves binging and inappropriate compensatory behavior (such as self-induced vomiting, or using laxatives) in order to avoid gaining weight. LEARNING DISABILITY - A disorder in which academic achievement lags behind general abilities and aptitude. This is usually due to a cognitive processing difficulty. This disorder is not due to, nor does it cause, behavioral disturbances, environmental factors, or low intelligence. NEUROPSYCHOLOGY - A discipline within the field of psychology that studies and applies research to the area of the relationship between brain and behavior. Clinical psychologists that work in this area assess, diagnose, and treat patients with neurological, medical, neurodevelopmental, and psychiatric conditions. These clinical psychologists also deal with learning disorders (see above) and cognitive disorders. OBSESSIVE COMPULSIVE DISORDER (OCD) - A person with OCD may develop anxious thoughts and/or rituals that he/she feels they cannot control and believe an impending sense of trouble if the rituals are not completed. Intense and disturbing thoughts and images are called obsessions while the rituals are called compulsions. Some people with OCD may recognize that their behavior is senseless, yet they cannot seem to stop the behavior. Others, however, may not realize their behavior is out of the ordinary. A clinical psychologist can assist a person by helping to change behavior and thoughts so the compulsions are no longer overwhelming or out of control. PANIC DISORDER - People with this disorder have intense feelings of terror that strikes suddenly and can reoccur without warning. A person with panic disorder may worry and be anxious in between attacks. During a panic attack, a person may feel dizzy, faint, weak, and/or numb. Additionally, a person may have chills, nausea, or chest pains. His/her reality may be distorted and they may feel a sense of doom or loss of control. Panic attacks usually last for no more than 10 minutes however, some do last longer. Panic disorders are treatable with assistance from a clinical psychologist. PERSONALITY DISORDERS - A person's inner experiences are significantly different and deviate from the norm. The differences may occur in thought patterns, behaviors, interpersonal functioning, and impulse control. These deviations occur over a long period of time and are across a broad range of personal and social functioning. As a result, a person may feel distress in his/her social, occupational, or personal areas of functioning. Individuals may also be able to trace this distress and difficulty functioning to his/her adolescence and early adulthood. PHOBIAS - Intense fears that actually pose no real threat or actual danger however can be extreme and/or irrational. Some common phobias include fear of heights, water, dogs, blood, flying, or insects. Phobias may begin in childhood and persist into adulthood. Social phobias include intense fear and overwhelming anxiety about social situations. Persons with social phobias may fear constantly being judged and also fear being humiliated by their actions. Social phobias can be so strong they may interfere with work, school, or other social activities. A clinical psychologist can help target treatment to alleviate symptoms of phobias. POST-TRAUMATIC STRESS DISORDER - This disorder can develop after experiencing a terrifying real or perceived threat to self or others. A person may have persistent frightening images, thoughts or memories, nightmares, and flashbacks related to the traumatic experience. A person may feel emotionally numb with people he/she was once close to. Anniversaries of the traumatic event can also produce flashbacks or intrusive images. PTSD symptoms can be alleviated through targeted therapy. STRESS MANAGEMENT - Clients learn various problem solving and coping mechanism skills and how to identify environmental triggers so that they may combat a stressful event before it becomes unmanageable as well as learn how to deal with internal stressors. SUBSTANCE ABUSE - Involves intense and prolonged examination of a person's addiction and the general psychological needs. 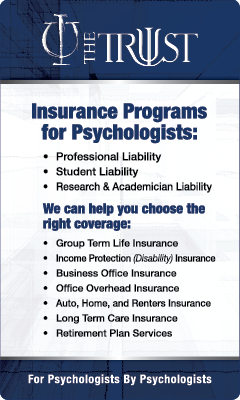 The clinical psychologist may determine the need for individual, family, or group therapy. Treatment plans may include out-patient or in-patient treatment. Self-help groups may also be necessary. ANALYTIC - Cognitive analytic therapy (CAT) is a system of treatment in which the therapist helps the patient to understand why things have gone wrong in the past and explores how to make sure that they don’t go wrong in the future. In simple terms, what it seeks to do is to apply the step-by-step pragmatism of cognitive therapy to some of the ideas of the more analytic approach of psychodynamic psychotherapy. (See Psychoanalytic Therapy for more details). BEHAVIORAL - employs learning theory to effect changes in behavior. It is usually symptom focused as opposed to working on unconscious material. Unlearning unwanted behaviors (even thoughts and feelings can be viewed as behaviors) and learning desired behaviors is the work of behavior therapy. BIOFEEDBACK - Biofeedback is a technique used to enhance relaxation and gain voluntary control of physiological processes such as muscle tension, heart rate, and blood pressure. Relaxation training has consistently been shown to assist and alleviate chronic pain, and the treatment of disorders exacerbated by stress. This may include: headaches, hypertension, insomnia, gastro-intestinal distress. COGNITIVE-BEHAVIORAL THERAPY - seeks to alter habitual maladaptive thought patterns. Unrealistic expectations, wishful thinking, living in the past (or future) and over generalizing can all lead to disappointment and frustration. Cognitive therapy emphasizes a rational and positive world view. It has proven to be especially effective with anxiety and depression. ECLECTIC THERAPY - although not a formal school of thought, it is the use of a combination of approaches or theoretical orientations. It is used by most therapists. There are many different blends. It is a recognition that individuals may benefit from a variety of techniques. The eclectic approach can be flexible and adaptive and avoid forcing treatment into one size fits all limitations. It is necessary that the therapist be well grounded in several of the more orthodox approaches to treatment rather than using bits and pieces through a lack of familiarity. EXISTENTIAL THERAPY - Originally rooted in existential philosophy, this therapy focuses on understanding one's existence in terms of his/her conscious experience. Another key aspect of existential therapy is helping clients to establish meaning in his/her life. One's freedom is thought to arise from making choices and an existential clinical psychologist can help one determine if he/she is making healthy or unhealthy choices. By examining one's choices, one also has the responsibility to take a particular direction in his/her life. FAMILY SYSTEMS THERAPY - A therapeutic approach that understands a person is part of a larger system. This approach focuses on productively changing the communication, emotional reactions, and relationships between two or more persons in a family or other system. The therapist can work with just one individual, however, the therapist usually works with spouses, parents, in-laws, children, and other family members, as well as others in school, work, church, or community. It tends to view change in terms of the systems of interaction between family members. It emphasizes family relationships as an important factor in psychological health. GROUP THERAPY - Treatment of individuals through the interactions of 5-10 members of a group. Groups are considered closed groups when they begin and end with the same members (each member enters group together, and remains together for the duration of the group). Groups are considered open when new members are introduced to the group each week and thus leave the groups at different times. Groups can be supportive, therapeutic, or educational in nature. Theories utilizing individual behavior and group interactions assist in the process of therapeutic change. HYPNOSIS - A procedure therapists use to suggest one change their experience of sensation, perception, thoughts, or behaviors. Hypnosis can be used to treat chronic pain, depression, anxiety, phobias, stress, habit disorders (e.g. gambling, smoking, etc. ), gastro-intestinal disorders, post-operative recovery, nausea, and many other conditions. HUMANISTIC THERAPY - Emphasis is on the whole person. There is less importance placed on the environment as determining behavior. Abraham Maslow and Carl Rogers are two notable clinical psychologists in the development of Humanistic psychology. Maslow stated that humans have a hierarchy of needs: survival, safety, love, belonging, self-esteem, and self-actualization. Carl Rogers' client centered approach focuses on supporting the client with unconditional positive regard, genuineness, and focusing the therapy on the client. INTERPERSONAL THERAPY (IPT) - Used to treat depression and other conditions as well as to improve interpersonal relationships. This treatment modality focuses on interpersonal disputes/conflicts, transitions that one may be facing, an well as grief that extends beyond normal bereavement period. IPT is a brief therapy that typically involves 20 sessions or less and is structured. While benefits of this therapy differ from person to person, research has shown that IPT is similar in effectiveness as anti-depressants for brief treatment of depression. However, other treatments may be more beneficial for chronic depression. MARITAL THERAPY - This is modality of therapy involves a couple involved in a committed relationship. This therapy provides a safe place where couples can talk and work through their issues. The therapist can help the couple develop new, better, and more efficient ways of communicating and conflict resolution. The therapist can also intervene to help the couple see and respect each other's point of view. MULTIMODAL THERAPY - A therapeutic approach that treats and changes clients' problems in one of seven modalities and the interaction between these modalities. These modalities include: behavior, affect/emotion, sensation, imagery, cognition/thought, interpersonal relationships, and drugs/biology. NEUROFEEDBACK - A form of biofeedback. The information collected is related to the electrical activity in several parts of the brain. Research has indicated that neurofeedback helps people learn how to manage ADD/ADHD. Neurofeedback can also be used after a traumatic brain injury to cognitively re-train the brain. NEUROPSYCHOLOGY - The applied scientific discipline that studies the structure and function of the brain related to specific psychological processes and overt behaviors. The term neuropsychology has been applied to lesion studies in humans and animals. PSYCHOANALYTIC THERAPY - is the personality theory and psychotherapeutic approach pioneered by Sigmund Freud. Freud is known as the father of psychoanalysis. However, today psychoanalytic therapy differs from the Classical Freudian style. Clinical psychologists that use this theory today help clients to interpret his/her unconscious wishes and motives and the conflict that one feels. This can assist the client in alleviating his/her symptoms and helping the client have a greater understanding of his/her self. The approach emphasizes making the unconscious conscious and thereby giving the individual choices in life rather than being at the whim of unknown forces within themselves. Most practice theories today however still at times use or focus on free association, defense mechanisms, resistance, interpretations of dreams, fantasies, and unconscious motives. PSYCHODYNAMIC THERAPY - A form of depth psychology, the primary focus of which is to reveal the unconscious content of a client's psyche in an effort to alleviate psychic tension. In this way it is similar to psychoanalysis, however, psychodynamic therapy tends to be more brief and less intensive than psychoanalysis. It also relies on the interpersonal relationship between client and therapist more than other forms of depth psychology. In terms of approach, this form of therapy also tends to be more eclectic than others, taking techniques from a variety of sources, rather than relying on a single system of intervention.